One of my favorite aspects of pineapple upside down cake is the buttery brown sugar and pineapple semi crisp deliciousness on the top. However when you make the cake the brown sugar, pineapple buttery goodness ratio to cake is a bit off. So last night I decided to make pineapple upside down cupcakes the same way I would my cake. Let me tell you these little guys are so amazing I have a feeling they'll be disappearing rather quickly. 1. Prepare cake mix as directed on the box. 3. Drain the juice from the pineapple, cut the maraschino cherries in half and allow them to dry on a paper towel. 4. Place a little over one teaspoon to a little under one tablespoon of butter in each muffin cup, and then add one tablespoon of brown sugar. 5. Place in the oven, and remove when the butter has melted. 6. 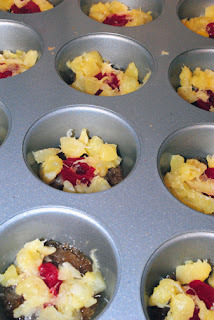 Place a half maraschino cherry in the middle of each cupcake and cover completely with crushed pineapple. Repeat in all cups. 7. Pour 1/4 cup of batter over top. 8. Bake for 8-12 minutes or until the cupcake is done. 9. Remove from the oven and immediately shake out onto a cool rack. I've made these before and they are so good! Yum! I need to make this. YUMMY! I need these now. This is like, friggin genius! I LOVE this idea! Those are the cutest things....and serving size ready. YUMMMMMY!! I've made these before and LOVE them! that is much simpler than I thought!!! These look delicious! I have to be honest I have never had pineapple upside down cake! That needs to change after seeing these delicious cupcakes! Um, I need these in my belly RIGHT now! I bet these taste just as good as they look. I love pineapple upside down anything! These are super cute. These are so cute! 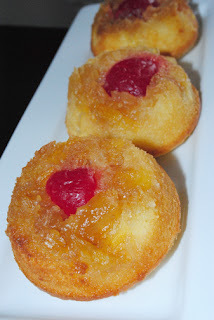 I love pineapple upside down cakes, but had never thought to do cupcakes! Such a great idea. Oh my gosh these look phenomenal. How tasty and cute. And what a great idea to make them cupcakes.